Wing span: 1 5/16 - 1 7/8 inches (3.3 - 5 cm). Identification: Hindwing is elongated. 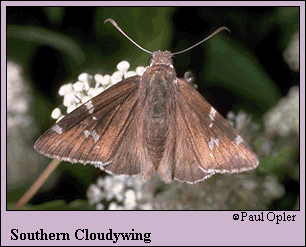 Upperside is dark brown; forewing has a wide band composed of aligned transparent spots. Male lacks a costal fold. Life history: To seek females, males perch on vegetation 1.5 to 4.5 feet above ground, usually on hilltops or knolls. Some males appear to use the same perch throughout their lives (which lasts no more than 2 weeks). Females lay eggs singly on the underside of a host plant leaflet. Caterpillars feed on leaves and live in shelters of rolled or tied leaves. Fully-grown caterpillars hibernate. Flight: One brood from mid-June to mid-July in the north; two broods (possibly three) from June-early October in most of its range. Caterpillar hosts: Various plants in the pea family (Fabaceae) including beggar's ticks (Desmodium), bush clover (Lespedeza), clover (Trifolium), milkvetch (Astragalus), fuzzybean (Strophostyles), and wild bean (Glycine). Adult food: Usually nectar from blue, purple, pink, or white flowers including dogbane, selfheal, crown vetch, Japanese honeysuckle, thistles, common milkweed, and others. Habitat: Open, scrubby places including dry meadows, burned areas, dry prairie hills, powerline right-of-ways, and others. Range: Most of the eastern United States from southern Maine west across the Great Lake States to Minnesota, Nebraska, southeastern Colorado, and northern New Mexico; south to central Florida, the Gulf Coast, and Texas.